The Varley-McKay Art Foundation of Markham (Charitable Registration Number 891618373RR0001) raises funds to support the Varley Art Gallery of Markham, with a focus on art acquisitions, conservation of the art collection, educational programs and exhibition research. The Foundation also operates an active volunteer program to further support the Varley Art Gallery of Markham. The Varley Art Gallery is a vital cultural hub in York Region. In 2017, over 44,000 patrons visited the Varley Art Gallery. Looking for the Varley Art Gallery? Please visit their official website. 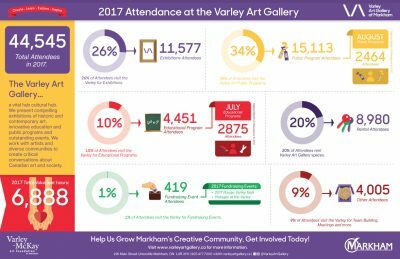 The Varley-McKay Art Foundation of Markham are proud to announce their fundraising events for 2019! As patrons, donors and sponsors of the Varley-McKay Art Foundation, your contribution ensures that we are able to continue supporting the Varley Art Gallery’s art acquisitions, exhibition research and educational programs. From staged commissioned portraits to lighthearted scenes of leisure, this exhibition explores the portrayal of children by Canadian artists in the nineteenth and early twentieth centuries. Collectively, these works offer insight into the changing conceptions of childhood within Canadian settler societies, including family dynamics, gender roles and class structures. Featuring many prominent artists from this broad period including Paul Kane, Cornelius Krieghoff, Robert Harris and Charlotte Schreiber, the works also speak to the development of a Canadian artistic milieu. The Varley Art Gallery acknowledges the ongoing support of the Varley-McKay Art Foundation of Markham in the development, exhibition and conservation of our permanent collection.